WAR UNICORN, tween fantasy by S.L.Carlson Release Date Today! My tween fantasy, WAR UNICORN, is now released for publication today by MuseItYoung, available at MuseItUp, Amazon Kindle, B&N Nook, and several others. I’ve been answering author interview questions this past week to be posted over the next couple of months with various blogsters. So, I thought I’d do an author self-interview to get the ball rolling. *I also have three eCopies of my book to randomly be given away to the lucky three picked from those leaving a comment here. Good luck! Sandy: So, S.L., welcome to my blog. When I think of unicorns, I think of cutesy mythological animals who are calm and lovely. Whatever made you think to make a unicorn into a warrior animal? S.L. : Good question, Sandy. And, by the way, thanks for interviewing me on your blog today. S.L. : To your question, that is the whole point behind my story. (Was there a pun there?) I was thinking of various fantasy creatures and thinking what twists I could give them. Then it struck me to give the loveliest of all animals, the unicorn, a very different twist. Sandy: I’m aware that you’ve self-published several historical fictions for middle graders — all of which I’ve enjoyed. Tween fantasy is for a different age and a different genre. Are you finding that difficult to separate the two? S.L. : Actually, no. That is the very reason I chose to use my initials for my fantasy books, to separate the author name with age group and genres. My middle grade historical fictions go by my common name and my tween fantasies go by my initials, S.L. Carlson. Sandy: Did you intend to let it slip that you have other fantasy books in the works? S.L. : Ha. So you caught that, did you? Yes. I actually have a middle grade fantasy out already called Star Opening, which was the first full story I wrote decades ago, revised and rewritten many times of course. I’m working on two other tween fantasies, one, the sequel to War Unicorn, and the other a collaboration with my son John. Sandy: I’m glad to hear there’s going to be a sequel. And a collaboration with your son? That sound interesting. S.L. : Thank you. The collaboration is indeed interesting, rather like two books in one…or three. Sandy: I’ll look forward to those. Thanks again for coming onto my blog today. Please let us know when your other interviews come out, and especially when your next tween fantasy is available. S.L. : You can count on it. 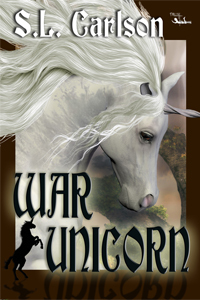 Sandy: Readers, don’t forget to leave a comment below for your chance to win a free copy of War Unicorn by S.L. Carlson. Contest ends September 7 at midnight. You may purchase your own copy at http://www.amazon.com/dp/B00MV8VDYG among other places. This entry was tagged Tween fantasy, War Unicorn. Bookmark the permalink. Hi Sandy! We met years ago at a SCBWI-MI conference, although I don’t expect you to remember me. Congrats on the release of your book! Looking forward to seeing you again at the Mackinac conference. Cheers! Thanks for your comment, Pam. I, too, look forward to seeing you again at the conference…soon! I want to read War Unicorn! Real bad. I’ve got to get my kindle account straightened out so I can order a copy. So good to see you at the conference, Sandy. Pam – I’ve met you before. Did I say hello at the conference? Hope so. There were many familiar faces there.